Saving Syria’s Children: Was BBC license fee money used to support an Islamist terror group protection-racket? 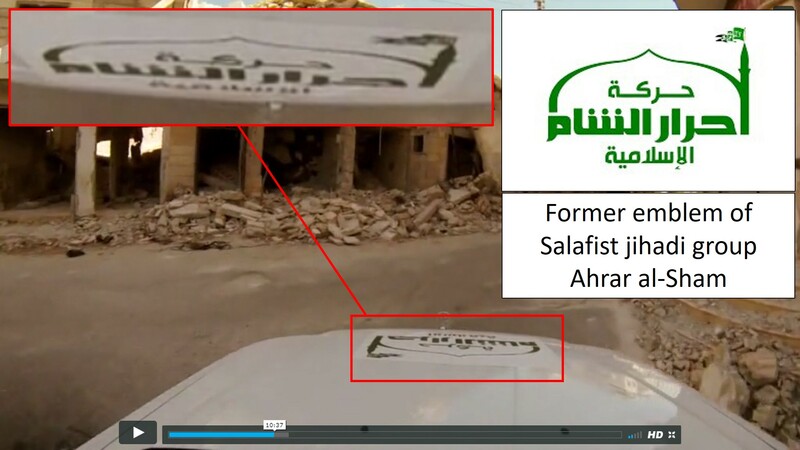 In Saving Syria’s Children the logo of Salafist terror group, Ahrar al-Sham, is visible on the front of one the vehicles in Pannell and Conway’s security convoy (Source: Robert Stuart). For many years I have been following Robert Stuart’s exhaustive and detailed exposition of the possible fabrications behind the infamous BBC Panorama documentary ‘Saving Syria’s Children’. The documentary was made in response to the alleged dropping of an incendiary bomb containing a “napalm-type” substance on the playground of the Urm al-Kubra school near Aleppo. The BBC team comprising reporter, Ian Pannell and cameraman, Darren Conway were inside Syria when the alleged attack happened. They reported on, and filmed, the incoming casualties arriving at the Atareb hospital on 26 August 2013. The footage formed the basis of the documentary. Stuart contends that the filmed sequences were largely, if not entirely, staged. Scenes from the documentary were shown as part of a brief BBC News at Ten broadcast report by Pannell and Conway which contained harrowing scenes of teenage boys and young men, their skin apparently in tatters, racing into what the report describes as “a basic hospital funded by handouts” to be treated for burns. In one particularly disturbing scene a tableau of young men writhe, drool and groan, seemingly in great distress. My first impression after having seen the film was that it was contrived and staffed by actors. What initially led me to this conclusion were the actions of the central figure, Mohammed Asi, who looked directly into the camera for several moments before raising his arm, at which point the group around him instantly became animated before moaning in unison. – Conflicting and contradictory accounts. – A “victim” who appeared to be grinning. – Implausible demeanours of alleged victims. – Questions as to the authenticity of the alleged burns to victims by experienced doctors. – Testimonies that challenged the BBC version of events. Saving Syria’s Children made reference to two British female doctors, Rola Hallam a ‘volunteer’ for the ‘charity’ Hand-in-Hand-for Syria, and (former?) BBC TV presenter, Saleyha Ahsan. Dr Rola’s father, Dr Mousa al-Kurdi, is a senior Syrian opposition member, while her on-site colleague, Dr Ahsan, is a former captain in the British Army Medical Corps. All of this information was hidden from the public by the BBC. The British state broadcaster has not addressed any of the legitimate issues raised by Stuart. All of the anomalies and contradictions highlighted call into question the authenticity of the entire alleged attack. The researcher has presented his findings in open public forums on numerous occasions and has not been threatened, legally, with any injunctions or forms of legal redress which would almost certainly have been the case had the allegations been false. Most recently, Stuart has argued, convincingly, that Pannell and Conway were given protection by the ISIS-affiliated Salafist terror group, Ahrar al-Sham. On 22 November, 2017, Stuart reported the activities of Pannell and Conway – that amounted to colluding with executioners – to Britain’s National Counter Terrorism Security Office. Not only is it shocking that the British public helped fund the production of anti-Syrian government propaganda in the form of Saving Syria’s Children, but that they also inadvertently helped support an Islamist terrorist protection racket to enable this to happen. It appears to be increasingly clear that BBC licence fee money was used to allow the safe passage of Pannell and Conway to and from the location where Saving Syria’s Children was being filmed. The actions of the BBC are not only inexcusable, but they have the potential to pose a serious risk to national security and to further undermine what little remains of the trust the public has in the national state broadcaster to report accurately and objectively on issues of national importance. It is clear that the BBC not only colluded in the production of false UK government propaganda intended to influence a vote in parliament to commit British troops to Syria in yet another illegal war, but that they did so by engaging in a sophisticated and well-planned series of events that involved the active participation of Islamist terrorists and their sympathizers. While the UK foreign office and high-ranking government ministers are eager to publicly condemn terrorist atrocities committed against UK citizens on British soil, what has not been widely acknowledged is the extent to which the British state is complicit in furthering the terrorists objectives in Syria. This has serious potential implications for all UK citizens in terms of helping to facilitate ‘blow-back’ on the streets of our towns and cities. Evidence produced from independent journalists like Vanessa Beeley, Eva Bartlett and others who have exposed the nefarious activities of UK-funded ‘humanitarian’ organisations like the White Helmets and Hand in Hand, add to accusation that the role of the BBC is that of a propaganda conduit for UK imperial power in the countries these groups operate. After having studied Robert Stuart’s analysis in detail, it is difficult to arrive at any other conclusion. « Theresa May’s Mansion House speeches: Is Putin an agent of the British state?